This is a comprehensive exploration of the petrels of Europe and North Africa. You can listen to previously unpublished digital stereo recordings of 23 species of petrels nesting on islets, islands and coasts of the North Atlantic and the Mediterranean. You will learn how to separate them by ear, with the help of clearly annotated sonagrams. You can read the author’s tales of making the recordings, and learn where to go to experience the birds. There is a series of full-colour plates and photographs for birdwatchers and especially seawatchers. Many of the photographs were taken at the same time as the recordings. Most importantly, read how the latest research is leading to the recognition of new – European – species, some of which are exceedingly rare. 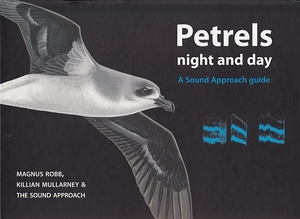 With 130 recordings spread out over two CDs, the sounds of Petrels Night and Day ‘illustrate’ the text in addition to excellent quality photographs and illustrations by Killian Mullarney that appear throughout. The second title in The Sound Approach series continues to set the benchmark for understanding bird sounds, regardless of the reader’s ability and experience. Written and illustrated by enthusiasts so be warned: this book could be the start of a serious obsession.